Here’s to your continued success in SELLING TRAVEL. Click on the store icon to opt-in. Click the store image to join. Well what can you say, mystery is in the eye of the beholder… and there are mysteries everywhere you travel and then some. Unravel a mystery or two for yourself and then you’ll have direct knowledge to market to your client list. Always keep an eye open for anything that’s new, different and causes your clients to think. Where have you visited recently, or in the past, that was anything bordering on mysterious? Now that could mean you were lost in the mist, you heard someone who wasn’t there calling your name, you noticed the angle of the pictures on the wall change… you were suddenly in a different time dimension and saw yourself in 2030… all clever stuff. A bit of Hollywood. So OKAY… BACK TO REALITY which in itself is a mystery! In truth, where have you travelled that haunts you for all the right reasons? Let’s get a handle on the word mysterious – the definitions come back as: difficult or impossible to understand, explain, or identify… puzzling, strange, peculiar, curious, funny, queer, odd, weird, bizarre, mystifying, inexplicable, baffling, perplexing, incomprehensible, unexplainable, unfathomable… and I bet that you can place a memory or two against each of those words. I once hitch-hiked across an area in the UK known as Dartmoor. Now that was freaky Friday let me tell you. And of course we had to be there as night fell. Not sure why now, I suppose we wanted to test our resolve and perhaps see if we could meet any of the mass-murderers being housed in the prison of the same name, who might be out for an evening stroll. Being out on the ocean can be mysterious. You can see things that may or may not be there. You can witness such wonderful skies and turbulent seas one minute and calm the next and even see a line where two colours of ocean meet. In the forests, atop mountain peaks, walking in the valleys and flying in a window seat… you can witness sights, sounds and events that you might class as mysterious too. After the death of a loved one, a white dove flew into the garden where I was standing and came right to my feet and stayed there whilst my Mum and I crouched down with our hands out… the dove stayed with us for three to five minutes and then it was gone. Ancient events often leave a trail and an atmosphere that you sense when you enter that space, you can touch walls and doors and again, get a feeling of what happened there. Real or being tricked, sometimes we just don’t know and all of this makes for great marketing and even more so if you have photographs or a video of what you experienced. In terms of UFOs, my wife scores two to my one! Well, I was driving and couldn’t look up, otherwise the score would have been 2-2. The Pyramids are mysterious. Easter Island is mysterious. Ghost ships like the Baychimo are mysterious. Bigfoot is in there somewhere too. Nepal has its own ways and what about those Nazca Lines and crop circles and similar phenomena? Did you know that there are hundreds of reports and books all about those crop circles and there are crop circle tours of the world too. Here’s one UK company that’s focused on this niche and their rates are $6,000 all-in for the tour and accommodation etc. Not bad! Another website that’s focused on this mystery uses a phrase Sacred Geometry and that has a nice ring to it. Part of your success in marketing and selling mysterious places will be how you label your company or products. Explore the Mysteries of… Walk Where Gods Walk Unravel the Mystery of the Vikings The Mysteries of Zen Buddhism Stone Circles, Crop Circles and More You have an excellent opportunity here to also include places that hold a “power” and those places can range from libraries to mountain peaks, to waterfalls, to a forest glade… and the power is often related to what happened ‘there’ or what the place of power holds such as an ancient text for instance. Why not ask your clients to BRING YOUR TRAVEL MYSTERY TO US and then plan that once-in-a-lifetime trip for them? TV Shows Hey look at this, on the Travel Channel… Mysteries at the Museum. Have you watched it? The shows are excellent and each museum they review gives you a new opportunity. Why? Well thousands of people in your neck of the woods just might be watching the same show. When you market a Museum Mystery Tour… featuring for instance four or five European museums all within a train ride away… well that’s a group tour itinerary ready to go. Waterfalls These thundering torrents have held visitors spellbound at their awesome power and some of them hold a mystery dating back centuries. Some have caves behind them, some footpaths leading ‘somewhere’ and some have rock paintings. Now if you want to view something spectacular click here. Cave Paintings These amazing records of our ancestors are losing their mystery as those that know are finding them and decoding them. For the moment tourists can still enter some caves to view ancient cave art – but that will cease soon as the breath of tourists cause the death of the artworks. Genealogy Mysteries At some point in their lives, usually around age of 50 – 60 people start to think about their ancestry and if you are watching the Genealogy Roadshow then you’ll know that so many people have a family mystery that needs solving. You can embark on a tour to Europe, South America, Eastern Europe, Asia and focus your tour on helping certain people (could be by race, religion, interest…) get to places where they can attempt to unravel their own mystery. Mysteries of the Universe Are we alone? Are we watched? Do those cave paintings tell us something we ought to know? Probably watching too much TV however, the universe does hold one heck of lot of mysterious things and you can bet that once again, thousands of people in your area have questions. Just to gaze up through a powerful telescope can be life changing. A trip to all the famous telescopes in the world might just be a tour you could offer. Real or Fake? Well, the photo is fake... a combination of a seascape, a rock from my garden and a silhouette of me, layered together after removing the backgrounds. Fake or not, you can create your own imagery to market what you sell. Are you great at selling travel but not sure how to market yourself? Join... • you keep 85 -100% of preferred supplier base commission. • Have your personalized, fully-bookable website. • Get commission paid twice monthly! why wait? • enjoy your own phone extension that rings at your home. • Upload your promotions to over 300 social networks in seconds. • Know where you stand with real time commission tracking. • Gain access to 100s of suppliers thru our affiliation with traVeLSaVerS. • High end customers? no problem with the affluent traveler Collection. • Get your own personal dashboard report to manage your bookings. • Marketing that includes direct mail to your customers. Work in the comfort of your own home! Your Mystery Active Ingredient, Steve Gillick, President, Talking Travel An off-quoted phrase is that “yesterday is history, tomorrow is a mystery, today is a gift and that’s why they call it the present”. We can complicate things by citing the 1964 song, Forget Domani (Forget tomorrow), as “tomorrow never comes”. So where does this leave “mystery”? Historically, the word ‘mystery’ referred to secret rites, divine rituals and something hidden from mere mortals. Today we refer to anything that is hard to explain as a mystery. Stonehenge is a mystery. The pyramids of Egypt are a mystery. So are the whirling dervishes in Turkey. But as we probe deeper and scientific explanations turn mysteries into probabilities, a sense of discovery still exists. And from the point of view of human curiosity and travel, the sense of enchantment, supernatural, hidden meanings, fantasies, storybook tales and innate wonder, seems to take over our sense of logic. The idea of placing yourself in the state of mind that “I am witnessing this for myself; The idea of placing yourself in the state of mind that “I am witnessing this for myself; I am a modern day explorer on my own terms, I can be Indiana Jones or Lara Croft or the real life Freya Stark or Wilfred Thesiger, is very compelling. Mystery for the sake of mystery becomes a bone fide attraction and becomes a strong draw for travellers looking to put their own footprint on the globe. that stretches from Cafayette to Salta in northern Argentina; and exploring deserts, gorges, canyons, waterfalls and rivers. Some mysteries inspire reflection: the Potala Palace in Lhasa Tibet, the city of Bhaktapur in Nepal, the Palace of the Winds in Jaipur, the Taj Mahal in Agra, Machu Picchu in Peru, Pompeii in Italy, Goreme in Cappadocia, and more. It’s a veritable world of wonders out there and the sense of mystery is a very personal ‘driver’ of travel dreams. For the travel seller it’s necessary to consider your own travel ‘drivers’ and then interview your clients with the same sense of awe and enthusiasm as you would plan your own journeys. Create the atmosphere. a. Posters on the walls b. Photos or short videos of mysterious venues c. Subtle music playing in the background (Irish reels or Indonesian Gamelan or Taiko drumming or Brazilian folk) d. Tasting options. Keep a few bottles of local drinks on hand to give a tiny taste of the destination (wine, whiskey, sake, pisco sour) e. Attitude. Nothing puts a damper on the mystery of travel than a travel agent with a blasé attitude and an order-taker mentality. Perk up! Get enthused! Show dynamic positivity. It’s infectious and your clients will reciprocate with their own enthusiasm. 2) Qualify the client a. Ask open-ended questions during the client interview. “If you could wave a magic wand, where would you want to go; what would you want to see and experience” b. Where have you been—where haven’t you been? Try it yourself! Remember that every time you travel and for whatever reason, you are investing in your career. a. Ask questions, take photos, assume that one of your clients will want to travel to the same destination at some point in time. b. Know the basics: the attractions, hotels, restaurants…but also know the mystery? Where is the mystery and why was it so compelling? 5) Don’t underestimate the ‘call’ of mystery in the travel-selling equation. The Potala Palace, Lhasa, Tibet. Sigiriya (The Lion's Rock) Sri Lanka. Santa Ana Volcano, El Salvador. The big ship rolls with the heavy swells. Cold winds sweep the open decks. Spindrift whips off the tops of restless waves. Keeping station on either side of the upper decks, a dozen or more albatrosses ride the air currents with practised disdain for the howling wind. Gliding just above the wake left by the cruise liner’s passing, another squadron of albatrosses follow us with effortless style. Albatrosses, mariners believe, are the wandering souls of the sailors who lost their lives near Cape Horn. If the legend is true, those souls are now graceful in the extreme. We’re crossing the Drake Passage, a 600 mile wide part of the Southern Ocean, where the winds and waves are unhindered by land. They power in from the west on a non-stop parade around their cold and stormy domain at the bottom of the world. Cape Horn is behind us. We left that craggy promontory astern a few hours ago. Ahead is the icy continent of Antarctica. We’ll see her massive glaciers, vast snow fields, drifting icebergs and her exuberant wildlife tomorrow. For now, late in the afternoon, some passengers are sampling wines, or drinking coffee, reading books, playing bridge. Others, equally disinterested in the ocean outside, are playing bingo, or feeding coins into slot machines. The hardy few, all bundled up against the cold, share the promenade deck with me. All of us are anxious for our first look at the vast southern continent of ice and snow. Together, until sunset, we scan the waters for signs of whales, or dolphins, and we watch the skies for the wide wingspans of the great birds that frequent this desolate, mysterious part of our planet. We are out on deck again at daybreak, determined not to miss anything if possible. Weather conditions, however, interfere with that plan. We pass Smith Island’s latitude but could not see it due to the misty weather. A couple of hours later, after passing a few large, drifting icebergs, we enter the Schollaert Channel, cruising between the rugged shores of Brabant Island on the starboard side and Anvers Island off to port. Check the Selling Travel Store at the end of March, or Opt-In to the Store list and be notified when this guide is published. side. It’s not for everyone of course as some of us are just not humourous. Not so say some have no sense of humour, they do, but they just cannot impart it and when they try, well everything goes pear shaped. But then, if you can’t say it, can you spell it out, can you write it, can you create it in a graphic? These are the tools you can use, if you don’t happen to be a stand up comedienne like Steve Martin or Carole Burnett. If you can laugh at yourself and have stories to tell and photos too, then you are on your way to selling more travel and laughing all the way to the bank – and that my friends has a nice ring to it! Are you a woman in travel? Could you emulate any of the female comediennes? Are there stories you can tell that are funny, happened to you or your clients? If so, then why not script yourself for a short stand up introduction to open a consumer event with? It works. Believe me. Agency Comics & Cartoons Find yourself a local cartoonist, tell them all about the things that have happened to you and also to your clients when they travel. Let your cartoonist create your comic strips and cartoons for you and then you can select the best ones for your website, flyers and even your brochures. Believe it or not, this takes practice. If you intend to sell with a smile then we’re talking about in person, on the phone, via your website, in your written communication and over social media too. That’s a lot of smiling, but it will be worth it. Let’s start with your website as this is where so many customers and customers-to-be go when they want to check you and your agency out. Whether you are a single independent, home-based travel agent or you work at a downtown, full service, physical location… your website is where the so called customer is won or lost in an instance. What’s On Your Screen That’s Humourous? Take a look to the right and note that this webpage belongs to National Geographic Traveller magazine, India. When I searched for websites with travel humour this was the first to pop up and it really does have quite a selection of funny “stuff” – even a video of Jerry Seinfeld talking about air travel. The key to this webpage and the humour it dispenses is that the humour is clean – and that’s important. I viewed other websites that actually boasted travel humour and comedy but I was put off by the lewd humour and expletives. Might be funny at another time and place, but there’s no need for it on, in this case, your website. To attract the visitor to your website and to have them stay on your website at least until they click to read about your services and latest tour offerings, all you need to do is to position a video slap dab in the center of your website. This video could be all about one of your funny encounters, it might be from YouTube or an embedded video you found online and it’s free to use, or it might be a series of funny images that you personally shot. Using my own website home page as the test page layout I’ve kept the header image and blanked out the rest of the page… now I can insert something humourous. Start with a title for your humour page. Factor in the word/s fun, funny, humour… in other words tell the visitor to your website what they’re looking at… then add a tag line to entice them to read on, click on, check out… or get in the mood to travel. A little humour at this point reduces the fear of flying and the hesitancy to book or try something new. I’ve come up with a name for my travel humour page as The Funny Traveller. How would you label your humour page? Get in the mood to travel with our travel humour page! This cartoon I’ve created is more a humourous reminder to the traveller that you get what you pay for and at the same time reminds them of the time they booked on line or paid for cheap seats and got them! Think beyond the humour for a real time meaning / education behind the words/image. As far as we know from those that do website testing, the typical visitor to a website will spend 20% of their time, which could be three seconds, focused on the center of your webpage. If that is true, then that’s where you’ll want to play your humourous video, or set up a slide show of funny images or embed a cartoon. If you have your humourous content behind a tab on the navigation bar labeled Resources for instance, not too many visitors will find it let alone click on it. This is why it’s important to make use of that Home Page real estate. If your website is a ready-made template design established by the company you work for or hold a membership with, then if you can update your website without HQ consent, you will need to look for areas on your home page where you can place your humourous content. If there is a spot vacant to the top right – go for it as our eyes tend to end up there after we have swept them across the webpage. The Women Only market is there for every female travel agent to consider as a niche – so think about what you currently sell and ask yourself if there is a ‘women only’ opportunity where you live. This new publication includes a review of travel safety which is the #1 challenge for the travelling woman. Travel safety then is a key component to running a successful women only niche. Not every female traveller is a shopper. Some like fly-fishing, cuisine tours, others a discussion group around a campfire lost in the mountains… so never generalize. For every activity there’s a woman waiting and wanting to do it, by herself or with like-minded women. Check the store today. out where those money making seats are. Some corporate agencies have the software that will keep searching for a selected seat. When that seat clears â&#x20AC;&#x201D; zap! It has been secured and reserved. Study SeatGuru.com to know where the best seats are and know what you will charge for this service. Click on PAGE and you will see two options: Send the home page or just the link. It's your choice. Sending the page is more graphic and grabs more attention. Be sure to test send your home page to your own email account to make sure the webpage arrives intact. Sometimes the graphics do weird things. If your home page does not look good, then you know to just send the link and add your message. Seatbelt Signs On: Sure you can wait until someone asks about "any seats to..." or, you could unbuckle, be proactive and check availability in the morning. You'd be checking the point-to-point or end-point destination you sell the most. Knowing seat availability, you can now e-mail or call your "last minute flight club" (you do have one?) and say, "Hi, this is Getaway Gertie calling. I have two seats to (destination X) leaving like now! And I have a great spa that will go with those dates too!" And the fee to go with that is your next statement. To download your own copy of this report please click HERE. A funny thing happened on the way to my Facebook page. I received an email from Facebook, I think… looked like it. But? Anyway it was mentioning new rules for business pages and the fact that I had to operate a Personal Page and migrate to Business Manager… and then a whole bunch more work to meet the new rules. With 729 LIKES I thought I’d delve deeper and so clicked on INSIGHTS found on the top toolbar. Once there you can view the data that’s all about your page. When you click on Insights you will see another tool bar listing LIKES and PEOPLE. I clicked on People first to find out where my LIKES where coming from. The chart shown here is first up and it discloses Male to Female ratios and age brackets and further down, where your LIKES come from. I cropped the chart as shown here in the table, and out of my 729 LIKES you can see the split: 394 live in the USA, 229 in Canada… and there’s that one LIKE from various countries – even Uzbekistan! Next I wanted to know WHO my LIKES were. To find that out, I clicked on LIKES and here was my about face – 60% of the LIKES did not sell travel. that takes me to their Facebook page. If there’s no sign or mention of being in the travel industry that LIKE is removed. Turning my experience to your own use – you’ll need to check out WHO is behind the LIKES on your own agency Facebook page, and then delve into their Facebook page to find out their status and any mention of employment, recent trips, up-coming travel etc. If there’s no mention of any such thing, or they have booked and paid and travelled and returned and that booking did not go through your agency, then you have a couple of options. One would be to contact them and ask why, the other to remove them from your list. HOWEVER… here’s a great tool just introduced and it is a CALL TO ACTION button. Selling travel today means knowing more than just where places are and the best hotels. Today the travel professional needs to show their knowledge as it relates to travel related “things” and these things could be services, applications, and especially techno gadgets that could help make a client’s trip more enjoyable. Here’s a few tips: iStick USB Flash Drive This drive is so simple. You use the Lightening connector to attach it to your iPhone or iPad and you then you have an additional 16, 32, or 64GB storage for and let’s go for photos. Now, your travellers can shoot to their hearts content and not worry about storage space. They can retain all their apps and let the Camera Roll transfer to the iStick. To transfer images to a computer you slide the slider to reveal a USB. Click here. SanDisk iXpand™ Flash Drive for iPhone and iPad iXpand™ Flash Drive is the easiest way to transfer photos and videos between your iPhone, iPad, PCs and Mac computers. Quickly free up memory on your iPhone or iPad, and instantly expand storage by up to 64GB. You can search online for where to purchase in your local area. Click here. CardRecovery Software Data Recovery Tools for Camera Cards Price: $39.95 (USD) per copy. No monthly fees. You can keep and use the product permanently to recover an unlimited number of files. Free 2-year upgrades. Click here. Depending on which camera card your client uses, they can also go to their website and look for Data Recovery. I Vest SHAMAN HTUC-System (Hi-Tech Utility Clothing System) Technophiles tend to travel with lots of hardware and gadgets. Each of those gadgets often needs its own charger and we need cables to connect those gadgets to other device. In short, we need lots of space for our electronics when we travel. Shaman HTUC (Hi Technology - Utility - Clothing) System Shaman product utility wear as the light weight pro reporter vest system and the electro traveller vest emphases the concept that travelers and pro photographers should wear all of their devices and accouterments within their, backpack, or luggage but in their HTUC. Click here. 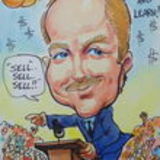 Hereâ&#x20AC;&#x2122;s where you find even more ideas on how to sell travel and boost your revenues. Ct is the trade magazine and every article I write is always geared to new business generation for YOU and your suppliers. The content ranges from a step by step how-to article to a comment about a current topic. Many of the articles are worth reviewing with your suppliers should you be able to work together to generate that new dollar for all. Click here to read. The full Canadian Traveller logo represents the consumer magazine that now reaches millions of readers. Even if you have your own in-house magazine it is always a good idea to tell your clients about the consumer CT and the main reason for that is some supplements are shared between the trade and consumer magazine. 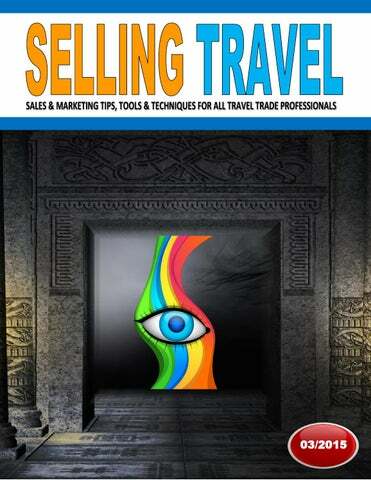 Now you know what your client is reading, you can, from the trade issue, learn how to sell various destinations and then make the call. Everything CT does targets new business generation and hopes to put more money in your jeans. Click here to read. Our online bookstore is overflowing with training options to boost sales and increase your knowledge on just about any topic! In addition to The Travel Instituteâ&#x20AC;&#x2122;s certifications and specialist courses, we are stocking the shelves with other valuable content. Travel Institute members save ten percent on every purchase. Home-Based Power Pack (books and a CD) by Anita Pagliasso. 5 downloads from Penney Rudicil, The Gadget Girl, starting at only $4. How to Turn Inbox Leads Into Sales (in print) by Stuart L. Cohen. store and let them design their own. What You Get Ordering Binder - Complete binder with designs, fonts, product and much more including samples of products and order forms. Custom cover on binder with your logo. 5 Cover options to choose from! Agent Cards - 250 Agent I.D. cards with your Agent Code. 30% off Marketing Products - If our logo is on your marketing you get 30% off. 30% Commission - On everything your brides order online with your Agent Code. and call or email for your Dealer Agent Code today.